When creating a design for embroidery it is hard to know which comes first: the fabric or the design idea. In this case, my initial inspiration was definitely this exquisite piece of silver and silk Obi fabric. This design was inspired by my appreciation of the Art Nouveau movement which flourished in Europe between 1890 and 1910. I have many books in my personal library on this subject. I use these constantly for inspiration. I greatly admire the graceful flowing, sinuous lines, combined with ornamentally styled flowers and plants which are typical of this period. 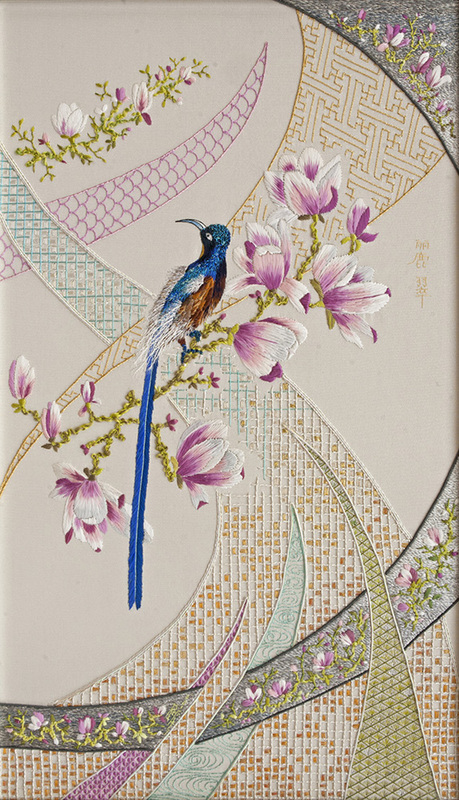 In my design, I combined flowing Art Nouveau lines with a naturalistic interpretation of a Bird of Paradise and Magnolia Blossoms; these were inspired by my recent trip to Costa Rica. I decided to use the bright colors of the bird and flowers to attract the viewer’s eye, and then by the use of long sweeping curved lines, to guide the viewer to follow the design from top to bottom and around the fabric. I purposely left areas of my design without embellishment, so that large areas of the ground fabric remain visible. I used Japanese embroidery stitches and techniques, including overlaid embroidery, flat and twisted silks, metal threads, geometric patterns and couching.